During the 2004 to 2008 field seasons, approximately 200 hand samples of fault and polymetallic vein-related rocks were collected for geochemical and mineralogical analyses. The samples were collected by the U.S. Geological Survey as part of the Evolution of Brittle Structures Task under the Central Colorado Assessment Project (CCAP) of the Mineral Resources Program (http://minerals.cr.usgs.gov/projects/colorado_assessment/). The purpose of this work has been to characterize the relation between epithermal, polymetallic mineral deposits, paleostress, and the geological structures that hosted fluid flow and localization of the deposits. The data in this report will be used to document and better understand the processes that control epithermal mineral-deposit formation by attempting to relate the geochemistry of the primary structures that hosted hydrothermal fluid flow to their heat and fluid sources. This includes processes from the scale of the structures themselves to the far field scale, inclusive of the intrusive bodies that have been thought to be the sources for the hydrothermal fluid flow. The data presented in this report are part of a larger assessment effort on public lands. The larger study area spans the region of the southern Rocky Mountains in Colorado from the Wyoming to New Mexico borders and from the eastern boundary of the Front Range to approximately the longitude of Vail and Leadville, Colorado. Although the study area has had an extensive history of geological mapping, the mapping has resulted in a number of hypotheses that are still in their infancy of being tested. For example, the proximity of polymetallic veins to intrusive bodies has been thought to reflect a genetic relation between the two features; however, this idea has not been well tested with geochemical indicators. Recent knowledge regarding the coupled nature of stress, strain, fluid flow, and geochemistry warrant new investigations and approaches to test a variety of ideas regarding the genetic processes associated with ore-deposit formation. The central part of the eastern Front Range has excellent exposures of fault zones and polymetallic fault veins, subsequently resulting in some of the most detailed mapping and associated data sets in the region. Thus, the area was chosen for detailed data compilation, new sample and data collection, and a variety of structural and geochemical analyses. The data presented in this report come from samples of fault-related exposures in the Front Range and include elemental chemistry and mineralogy from the outcrop-scale study localities within the larger CCAP study area. Contains the elemental geochemical data. Contains the X-ray diffraction data. 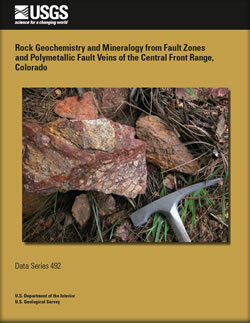 Caine, J.S., and Bove, D.J., 2010, Rock geochemistry and mineralogy from fault zones and polymetallic fault veins of the central Front Range, Colorado: U.S. Geological Survey Data Series 492, 6 p.